Hello there and thank you for stopping by today. Today is the last day of the MFT October Release Countdown. Only 22 hours until the new release (yay)! Be sure to head over to the MFT Blog for full set and die reveals for the day. This release is packed full of gorgeous new products that I have SO enjoyed creating with. My first card today features the Stitched Flowers Die-namics, which was a previous card kit component, finally available for separate purchase with the October release (YAY). 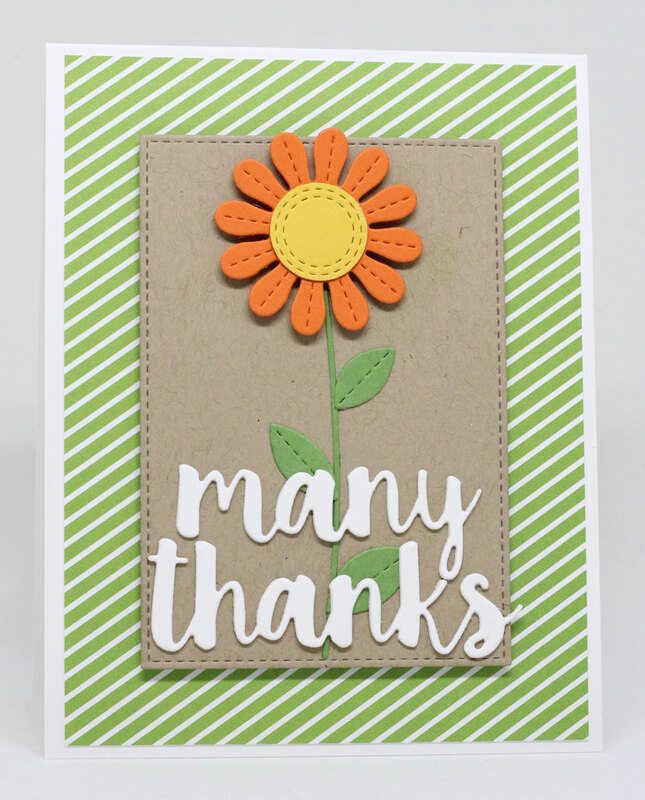 I used the Thanks Die-namics for the sentiment and some patterned paper from Birthday Blowout in the background. What a cute way to use one of the die cut flowers. Loving the words too. Love how you made one flower have such a big impact. Perfect flower card to produce a smile and give thanks! Jody, this is such a perfect Thank You card! Love the orange flower! So bright and happy and so "Fall" on the Kraft paper! Simple and sweet! Love this card.